There are doubts that the IMF bailout package could be a turning point in the external finances of the country. In my June 12th column titled “Will IMF bailout be tipping point to external financial viability?” I suggested that the IMF bailout and the international confidence it inspires could increase capital inflows to relieve the balance of payments crisis. I said that this in tandem with the IMF’s mandatory reform program could be a turning point in the country’s economic fortunes. I argued that the IMF Extended Fund Facility (EFF) would bring with it other additional capital inflows that would resolve the immediate balance of payments crisis as well as build international confidence in the economy. An integral part of that confidence building and economic stabilisation was the implementation of the reforms suggested by the IMF to ensure fiscal consolidation. The adoption of tax reforms and other fiscal measures to reduce the fiscal deficit were essential to achieve this turn around. Several readers have pointed out that my expectation was optimistic, especially due to the continuing mismanagement of the economy. 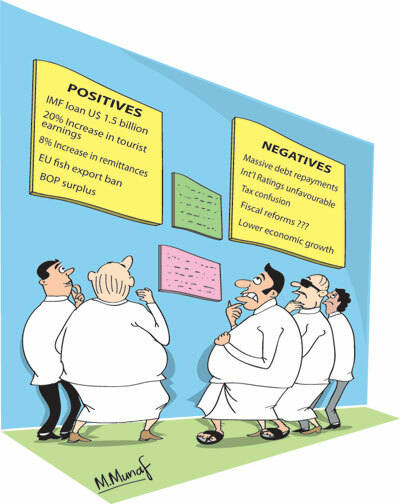 The contrarian view is that the IMF facility is not likely to be a tipping point owing to three reasons: that the EFF is not a significant amount of assistance in comparison to the debt repayment obligations of the country; that the IMF facility is unlikely to attract much finances from other sources; and that the government’s fiscal measures are inadequate to ensure fiscal consolidation that is crucial for economic stability. Critics point out that the IMF finances are too little to have a serious dent on the external finances, especially as the US$ 1.5 billion is being doled out in six instalments with a mere US$ 0.5 billion to begin with. This is small in comparison with the country’s repayment obligations this year that are several fold this amount. Furthermore, the expectation that the IMF facility would bring in much capital inflows is deemed optimistic though the IMF itself anticipates other capital inflows. Only time will tell whether there would be adequate inflows of capital owing to the IMF’s assistance. The government is unlikely to attract much external finances from other sources as there are fundamental economic factors that influence capital inflows. The inflow of capital from other sources will not be entirely dependent on the confidence brought about by the IMF facility. The government’s fiscal and monetary policies and its commitment to reforms would be dominant reasons especially for non-debt creating capital inflows. An important reason for scepticism is the lack of clear government commitment to fiscal consolidation. Mere imposition of VAT is not likely to ensure fiscal consolidation. And even VAT has become an uncertain tax. At present there is a surfeit of confusion about VAT, uncertainty about capital gains taxes and ambiguity of tax rates. These have eroded business confidence and given rise to doubts that adequate revenue would be harnessed. The current confusion in taxation policies is likely to slow economic growth. What is needed is an effective tax regime that collects about 15 per cent of GDP rather than ad hoc unpredictable taxes. Furthermore, the government has not shown adequate resolve to cut unnecessary expenditure. Expenditure on defence is increasing; the import of luxury vehicles had to be restrained by popular opposition and not as a government measure, and there is little evidence that the government is following an austere and frugal expenditure policy in the face of fiscal difficulties. Meanwhile there has been a downgrading of the country’s ratings by both Fitch and Moody’s. Moody’s Investors Service has changed the outlook from stable to negative owing to the expectation of a further weakening in some fiscal indicators “in an environment of subdued GDP growth which could lead to renewed balance of payments pressure”. Moody’s has however said that with the effective implementation of some of the fiscal policy measures and other structural reforms planned under the IMF programme, the government would be able to tap a significant potential revenue base. These ratings will not encourage foreign capital inflows. A silver lining in this in this bleak situation is an expectation of a balance of payments surplus this year. This was one of the reasons for expecting a turnaround in the external finances. A lower trade deficit, high amount of remittances, increased tourist earnings and earnings from other services are likely to result in a balance of payments surplus. A balance of payments surplus is likely as the trade deficit decreased by 2.2 per cent in the first quarter of 2016 compared to that of the same period last year due to a reduction in imports rather than a growth in exports. There is also a prospect that exports would increase somewhat in the second half of the year with the lifting of the fish export embargo to European Union countries. Remittances and tourist earnings have increased this year. In the first quarter of the year, remittances were 8.1 per cent higher and tourist earnings increased by 20 per cent in the first four months of this year compared to that of the same period last year. These trends portend an improvement in the balance of payments that could record a surplus of about US$2.5 billion. There are reasons to be sceptical of the IMF facility being a turning point owing to its limited amount. Its capacity as a catalyst for capital inflows may be small as other economic indicators are discouraging capital inflows. Most discouraging has been the inability of the government to get their act together. The government’s commitment to fiscal reform and to ensure fiscal consolidation is vital for external financial viability. Whether the post IMF loan period would be a turning point in the balance of payments and external finances would depend on the adoption of policies that would ensure fiscal consolidation and foster economic growth. One positive development is that there are signs of an improvement in the balance of payments this year.